This fine antique Victorian sterling silver mustard pot has an oval form. The body is encircled with embossed convex vertical fluted decoration. The upper rim and base of the mustard pot are ornamented with a scalloped shaped border, reflecting the aforementioned flutes. 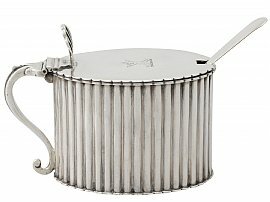 This impressive mustard pot retains the original plain hallmarked hinged cover, which also features a scallop shaped rim. The cover is surmounted with a fine and impressive pierced decorated sterling silver five lobed thumbpiece. The cover is further embellished with a fine and impressive bright cut engraved crest of in front of a saltire, an eagle's head erased, charged with a mullet. This impressive example of antique silverware has an S scroll handle ornamented with chased stylised leaf decoration to the upper portion. This antique sterling silver mustard pot is fitted with a removable blue glass liner. This Victorian mustard pot is supplied with a fine and impressive accompanying hallmarked Scottish sterling silver fiddle pattern mustard spoon; the spoon was hallmarked in 1836. 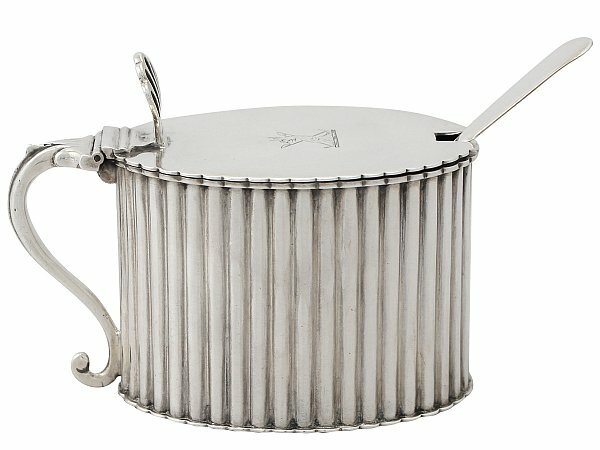 This mustard pot is an exceptional gauge of silver, fine quality and in exceptional condition. Full hallmarks struck to the underside of the base and to the reverse of the spoon, and part hallmarks struck to the interior of the cover are all very clear. Length from back of handle to rim 10 cm/4"